We welcome the opportunity to provide a network assessment of your existing phone solution and document potential savings and benefits of moving to a Louisa Voice solution! The Select voice solution packages an open source router and telephony voice server onto a single LV-NUC computing platform. The Select package is ideal for businesses where rich enterprise voice capability, flexibility, and cost-sensitivity are important. Ordering of SIP Trunk from carrier and coordination of telephone number porting. 90-day warranty on all services and support. To keep costs down, the customer can order the phones, Ethernet switch, and LV-NUC platform directly from suppliers or Louisa Voice can order customer equipment at an additional charge. 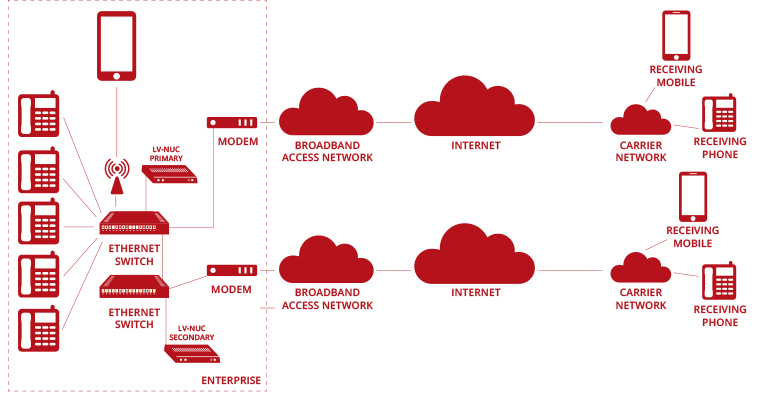 When your broadband access network goes down, Louisa Voice can build an optional Business Continuity Service that automatically detects when the SIP trunk is down, and routes incoming calls to 1 or more cell phones in your enterprise. The Select solution can also be bundled with a mobility service option that allows users to access the voice server from smartphones. A low-cost softphone application and open source VPN application are downloaded to the smartphone. These two applications are then used to place outgoing calls through the voice server or receive incoming calls either or WIFI or LTE over data solutions. Louisa Voice can customize monitoring and support services that meets your business needs. The Preferred voice solution delivers all the capabilities of the Select solution but adds a second LV-NUC computing platform to the solution for high availability purposes. The router and voice server applications run across the LV-NUC platforms – if there is a hardware issue with the primary LV-NUC server, the secondary LV-NUC server automatically takes over with no configuration changes. A service technician can then be dispatched to repair the primary LV-NUC and bring it back online. If your broadband network is reliable and your business relies on your voice and data network to be constantly available, then the Preferred solution is for you. Clients can start with the Select solution and upgrade to the Preferred solution as the business needs dictate. 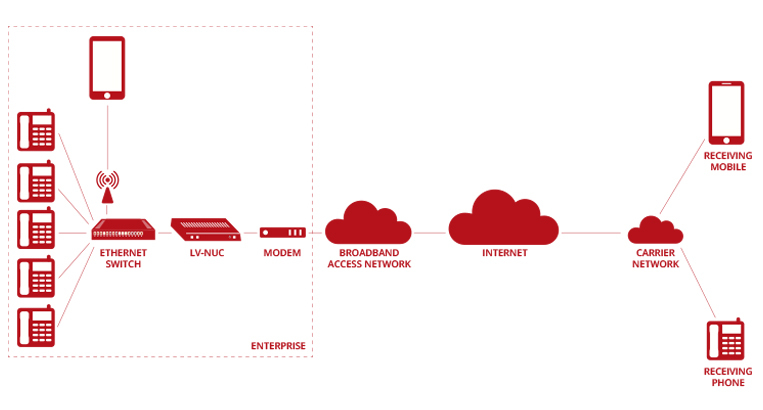 If your business applications are mission critical and require access to a second broadband access network for reliability purposes, then the Elite Solution delivers on this capability. The routers are configured to support a second broadband access network which gets used when the primary broadband access network goes down. 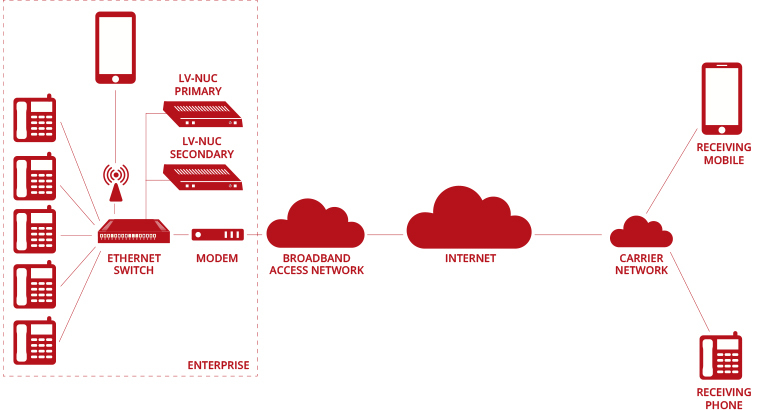 Higher end LV-NUCPlus computing servers can also be deployed which allows support for up to 50 phones. Clients that upgrade to the Elite Voice Solution from the Preferred solution can use their existing LV-NUC servers and supports up to 25 phones. Users can securely access their enterprise network data and services from mobile appliances such as smartphones, tablets, and laptops. Distinguish between business and personal calls on mobile phones.